A ruined stone house set in a quiet area for sale near Alvaiázere in central Portugal. The ruins, which measure 140 square metres of construction, do require complete reconstruction but are situated in a peaceful setting with a variety of mature trees including pine, figs, orange, eucalyptus and olive. The ruined house has been set over two floors and although requiring extensive rebuilding many of the original stone features remain including the carved stone window and door surrounds. The property is not connected to mains water or electricity and although has been in the past would require a planning approval with a schedule of works for reconstruction for the connection to be re-established. The property is set on a plot measuring approximately 3,200 square metres. The land surrounding the house is relatively flat with a stone wall creating a private garden area. The remaining land is slightly sloped and planted with a variety of mature and young trees. The property has a boundary with a quiet road and is only around one kilometre from the market town of Alvaiázere. The property is situated in an elevated position and as such has good views to Alvaiázere. Alvaiázere has three small supermarkets, a pharmacy, cafes, hardware shops, agricultural merchants, a rural museum, municipal sports centre, library, council, shops, cafes, bars, restaurants, petrol station, health centre, sports centre, library and swimming pool and is within walking distance of the house. The historic town of Tomar, which is famous for the UNESCO listed Convento do Cristo, is around 25 minutes drive by car from the house. Tomar is a bustling town (though is holds a city status in Portugal) and has around 40,000 inhabitants. There is a train station, bus station, municipal sports centre, museums, art galleries, bowling alley, cinema, cafes, restaurants and a popular weekly market. The closest airport to the farmhouse is located at Lisbon, which is approximately one and three quarter hours’ drive. 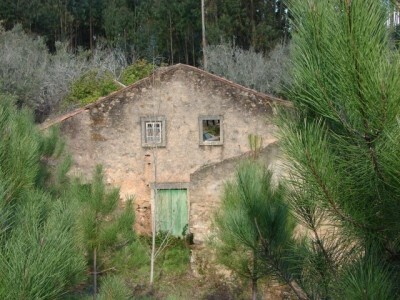 The property has good access links and the 110 Tomar to Coimbra road is a short drive away.